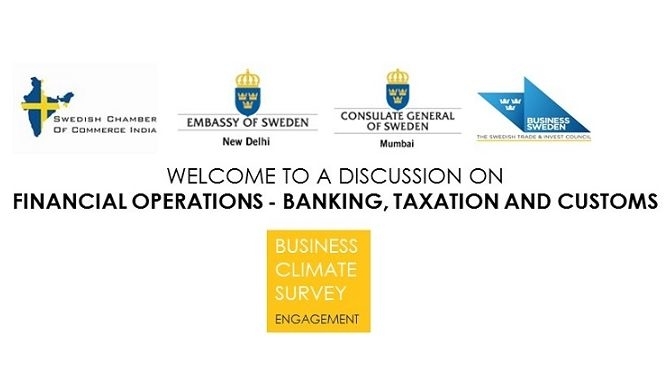 The Business Climate Survey (BCS) 2015/16 conducted within the Swedish Business Community in India high-lights issues related to a company’s financial operations such as banking, financing, taxation regulations and rates, import regulation and custom duties as areas of challenge for companies doing business in India. As part of the BCS Engagement Plan, we now follow up these issue and seek to engage with your company to understand the challenges and discuss a collaborative way forward. Team Sweden (Embassy of Sweden in New Delhi, Consulate General in Mumbai, the Chamber and Business Sweden) seeks to support Swedish companies in India in these areas, both on a central and state level. Please join us for a breakfast meeting on Friday March 11, 8:30 -11:00 am in New Delhi, to discuss your experiences and challenges in relation to these topic. An overview, based on the input from the BCS, will be presented by Ms. Anna Ferry, Counsellor, Head of Section Trade & Economic Affairs from the Embassy of Sweden in New Delhi to kick off the discussion. This event is jointly organized by the Swedish Chamber of Commerce in India, the Embassy of Sweden, Consulate General in Mumbai and Business Sweden.